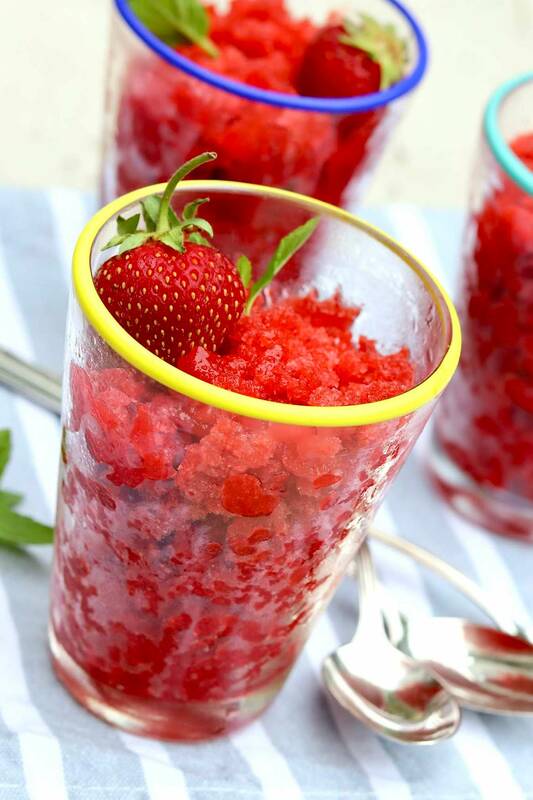 Sweet, melt-in-your-mouth granitas can be made with a variety of seasonal fruits for a refreshingly light dessert or snack all summer long. Start with this simple recipe for Strawberry Granitas and customize to taste with a variety of options. No fancy equipment needed! My husband and I hosted a big cookout over Memorial Day weekend. It was a fun time with 30-some adults and kids. Of course, a group of that size requires a lot of food, especially when most of the kids are teenage boys! After everyone had a cupful of the colorful treat, I surveyed what remained. Something possessed me to try the blue flavor–cotton candy. I’ve always been one to choose chocolate, vanilla, and other basic flavors over the fruity, candy-inspired varieties. So I was sort of “sampling” it to see what it actually tasted like, being pretty sure I wouldn’t care for it. But…sweet as it was, I loved it! The following night, I polished off what remained of the unnaturally blue (yet rather pretty!) Italian ice and briefly considered the notion of stocking my freezer all summer long with quarts from our nearby Rita’s. Instead of succumbing to that all-too-real temptation, I turned to the fresh berries in my fridge to create a homemade granita that’s loaded with whole fruit and decidedly less sugar. 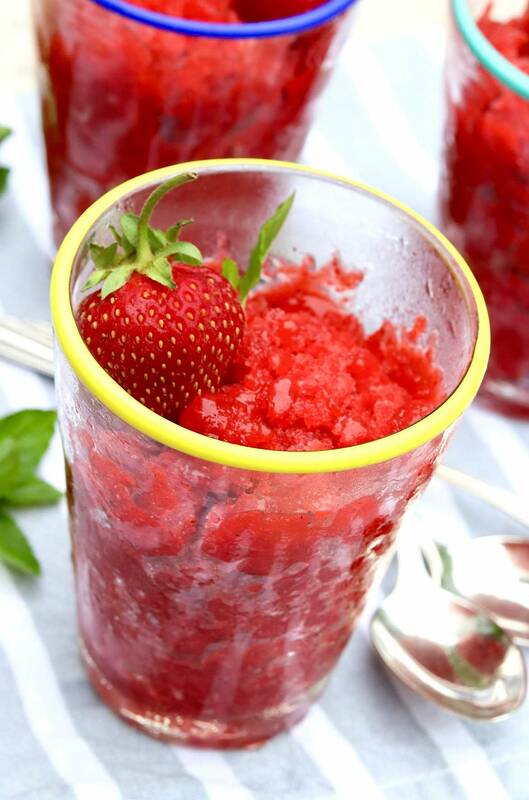 For those who haven’t tried, a granita is a frozen Italian dessert that’s similar to sorbet and Italian ice. However, because it’s traditionally made by hand rather than a machine, the texture of a granita is coarser and flakier–sort of like fruity snow! The first spoonful offers the slightest hint of crunch before melting gloriously on the tongue. Originally from Sicily, granitas are available all over Italy. Like many ethnic recipes, the details vary from region to region. Texture is the most obvious variant, from coarse and chunky on the west coast to smooth and sorbet-like in the eastern portion of the country. Different freezing techniques create the variances. For example, less agitation followed by scraping or shaving produces a snow-like granita whereas regular stirring and scraping yields coarser crystals. This set of photos shows how the granita transforms from the soupy, straight-out-of-the-blender stage to coarse crystals after a few hours in the freezer. The convenience of freezing via a commercial gelato machine has become increasingly popular and will yield an outcome more similar to sorbet. That said, a distinction can still be drawn, as a granita won’t be as creamy as ice cream or as compact as sorbet, even when a machine is used. Granitas can be made in a wide range of flavors, from coffee to traditional Italian lemon. During the summer, however, it’s fun (and easy) to reach for whichever fruit is at the peak of its season, from the first sweet berries to the last of juicy peaches and nectarines. Vary the flavoring — lemon and lime juice cut the sweetness and round out the flavor, but you could use just the zest (for flavor without tang) or infuse the water with mint. A good balsamic vinegar could also be used instead of the citrus. Make an adult version — I’ve drizzled Malibu rum over individual servings of granita to make a tropical, slightly slushy treat. Optionally, you could make a vodka slush, add a bit of Triple Sec, or whatever seems delicious to you. 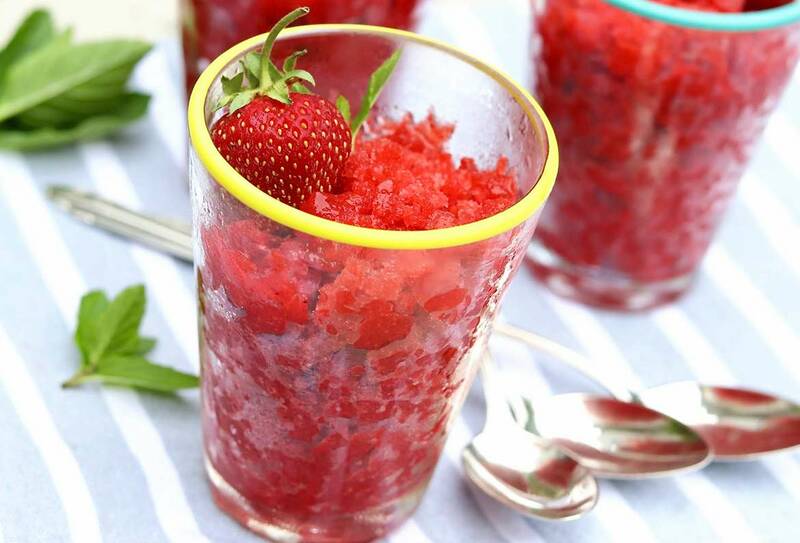 Sweet, melt-in-your-mouth granitas can be made with a variety of seasonal fruits for a refreshingly light dessert or snack all summer long. As the mixture freezes, simply use a fork to scrape the granita into flaky, sweet crystals and enjoy as is or in a homemade "gelati!" Stir the first 3 ingredients, starting with the 1/2 cup sugar, in small bowl until the sugar dissolves. 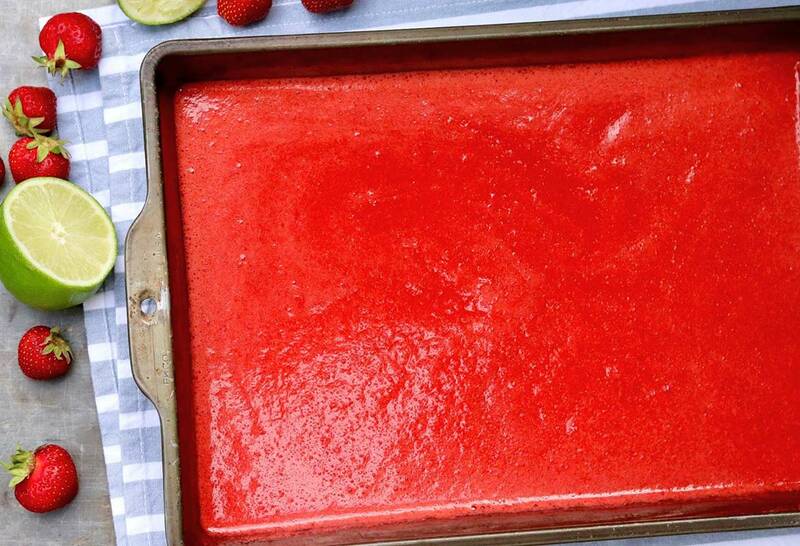 Blend the strawberries in a blender of food processor until smooth. Add the sugar syrup and blend until combined. Taste the mixture. If it’s not sweet enough for your liking, add a bit more sugar (I added 2 more tablespoons to my last batch because the berries were not overly sweet), blending thoroughly and tasting again. Similarly, if you prefer more tartness, you could add an extra squeeze of lemon or lime juice. 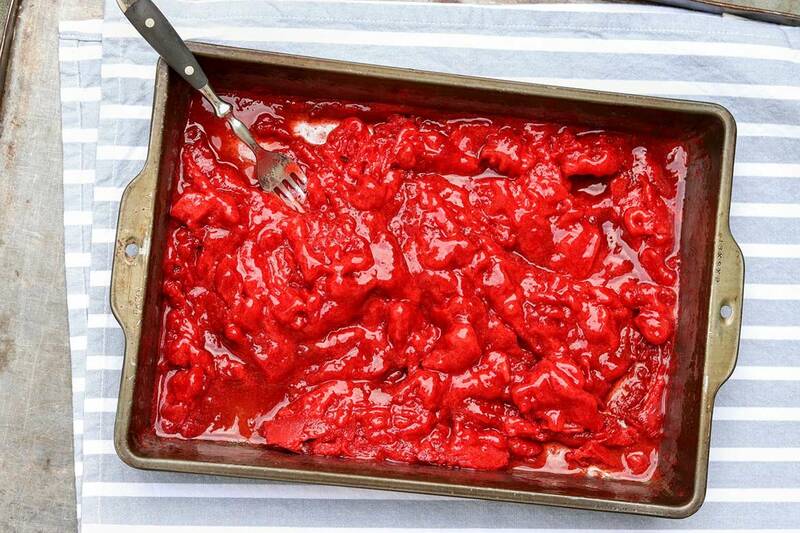 Pour the mixture into a 13x9x2-inch nonstick metal baking pan. Freeze until icy around edges, about 30 minutes. (I set a timer so I don’t forget.) Using a fork, stir the icy portions into the middle of the pan. Return to the freezer until the mixture is frozen, stirring the edges into the center every 30 or so minutes. This should take 1-1/2 to 2 hours total. After the mixture is chunky, it’s fine to cover and freeze overnight. The granitas won’t freeze rock hard at this point, so you can break them up further before serving. 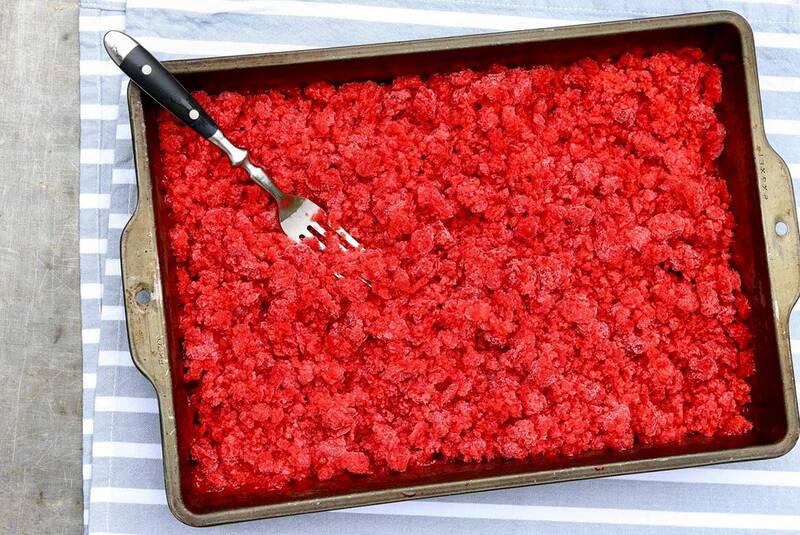 When ready to serve, scrape the granita into bowls, and garnish as desired. *You could omit the citrus for more pronounced sweetness, or substitute with a good balsamic vinegar. Mint offers complementary flavor, so you could also infuse your water with some fresh sprigs. Adult options: A small amount (a couple tablespoons) of your favorite liqueur added to the granita mix before freezing won’t inhibit freezing and allows for interesting flavor customization. However, you may wish to use this an option later so that both kids and adults can enjoy. Wow! That looks so delicious & refreshing. Just picked up fresh local strawberries today. I may need to get more! Thanks and enjoy those strawberries!